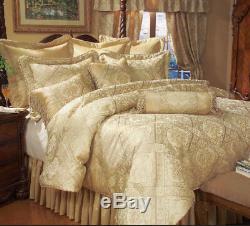 9 Piece Gold Imperial Comforter Set. This luxurious silky jacquard bedroom in a bag features classic regal pattern on softgold ground. 2 Euro Shams and 3 decorative cushions included. 9-Piece comforter set includes 1 comforter, 2 standard shams, 2 euro shams, 1 bed ruffle, 1 square cushion, 1 neckroll, 1 rectangular cushion. Comforter set fabric content: 100-percent polyester. Washing instructions: machine wash in cold water, tumble dry low Queen. Standard shams 21-inch by 27-inch+3-inch. Euro shams 24-inch by 24-inch+3-inch. Bed ruffle 60-inch by 80-inch+14-inch. Square cushion 17-inch by 17-inch. Rectangular cushion 16-inch by 20-inch King. King shams 21-inch by 37-inch+3-inch. Bed ruffle 78-inch by 80-inch+14-inch. Rectangular cushion 16-inch by 20-inch Cal King. Cal king comforter 104"x92". King shams 21"x37"+3. Euro shams 24"x24"+3. Bed ruffle 72"x84"+14. Rectangular cushion 16"x20" Full. Bed ruffle 54-inch by 75-inch+14-inch. Rectangular cushion 16-inch by 20-inch. You have two check-out options. Button at the top of this page. Please do not, however, wait more than 15 days to pay for any order, as this will result in your order being canceled and your item being re-listed. All return items must include original packaging and are in resalable condition. We will not accept any used, washed or damaged products. The item "9 Piece Gold Imperial Comforter Set" is in sale since Friday, June 24, 2016. This item is in the category "Home & Garden\Bedding\Comforters & Sets". The seller is "kinglinen" and is located in Fontana, California.